Back to blogging after a couple of weeks of running the farm while dad took a much needed break. The farm is pretty busy at this time of the year, especially when there is only one person working. To give you an idea, a day on the farm during summer usually includes: milking 75 cows twice a day, shifting and maintaining pasture irrigation, checking Springers (pregnant cows/heifers) and sometimes assisting during difficult labours, feeding young heifers and springers, shifting electric fences (part of our strip grazing pasture management strategy – ensures the pasture receives a break from grazing pressure, which aids in pasture growth, reduces disease risk, reduces the risk of compaction, etc), checking cattle in the hill country, grinding grain (mixed with essential minerals and fed during milking to ensure the cows remain healthy), washing milk vats, a quick swim in the river 🙂 and finally feeding the working dogs. The days are long but also very rewarding and every day seems to bring something new. After arriving home I thought I would share with you some of the Agricultural reading material that I have read and referred to for different farming ideas, strategies and inspiration. 1. Omnivore’s Dilemma (Michael Pollan) – An interesting read based around three food systems. Factory farming, Pasture/community based agriculture and hunter gathering. Think, Food inc. the movie. 2. In My Experience, Malabar Farm, Pleasant Valley, Out of the Earth (not seen) (Louis Bromfield) – Written in the 40’s & 50’s these books are still very relevant and describe agriculture, nature, communities and farming with passion, intelligence and optimism. The style they are written in makes them easy to read and I cannot recommend them highly enough. (Pleasant Valley is a good book to start on). 3. Home Cheese Making (Ricki Carroll), The Home Creamery (Kathy Farrell-Kingsley), Home Dairy (Ashley English) – These three books are great guides for making dairy products. The home creamery is a really simple book, while Ricki Carroll’s book is a good start for cheese making, Ashley English’ has produced a nice in-between book that is great for simple dairy products and cheeses. (Remember, these are American books including Imperial US measurements. For any Australian’s interested, I would go for Home cheese making by Neil & Carole Willman. Tip: If you live in Australia try this site for your cheese making ingredients, I have found it to be very price competitive and the postage is quick). 4. The Biological Farmer, Advancing Biological Farming (Gary Zimmer) – Modern day, in depth and very informative books, great for those interested in a practical view about managing soils and animals in a way that is sustainable, high yielding and efficient. Highly recommended for those involved in dairy/cropping or higher intensity/input type farming. 5. Agriculture in transition, From The Soil Up (Donald Schriefer) – Great books for understanding more about the soil and its elements. I would probably just purchase From The Soil Up. Note: This is probably more suited to farmers/gardeners who use tillage as a tool. 6. Eco-Farm (Charles Walters) – A great book covering just about everything to do with farm management, from animal health to insects, crops, the lie of the land, soils, nutrients etc. 7. The Weather Makers, Here On Earth (Tim Flannery) – Two very good books, which discuss climate change, envirnomental history and the science behind the situation we find ourselves in today. Written by a renown Australian Scientist these two books are easy to read and provide compelling information about why our climate is changing. 8. Agroecosystem Sustainability (Steven Gliessman) – A book based heavily on ecological Agricultural case studies from around the globe. This was a book prescribed for one of my university subjects, however it is very interesting to see how different communities and farmers, especially in third world areas have adapted and created sustainable food systems with the little resources they have access to. 9. Family Friendly Farming (not seen), You Can Farm, Pastured Poultry Profits (Joel Salatin) – Brilliant books to read. If you have never seen Joel Salatin speak about their farm “Polyface” in Virginia’s Shenandoah Valley I strongly suggest that you check out Food inc the movie or YouTube some clips. This food production system makes sense, especially if you only have a small amount of land. For all those young or old farmers out there with a wealth of Agricultural experience don’t let the title “You Can Farm” put you off, as there are many good chapters in the book about economically introducing enterprises into your farm business, while increasing your return per acre/hectare, improving your soil health and increasing the viability of farming on small acreage. 10. The Farmstead Creamery Advisor (Gianaclis Caldwell) – A relatively new book (2010) that leads your through creating a successful home dairy/cheese business. A great read if you are considering starting your own dairy business or simply looking to add value onto your existing operation. Again, this is an American book so some things such as, legislation, regulations and sizing will be different from your country if reading from outside the US. 11. Assorted gardening and self sufficiency books – Always handy to have on the shelf for quick reference on what/when to grow, how to make/preserve various products or quick guides for identifying fruit/veg pests. There are many other great authors and publications out there on sustainable Agriculture (Sir Albert Howard, Rudolf Steiner, Wendell Berry, Merck Vet Manual, Acres Australia Newspaper, etc, etc) many of which I have skipped. However, I hope to have given you a look into some of whats out there, as I feel that reading different publications about farming can greatly improve the way in which we think and act on our own farm business. Often there will be ideas or systems that we don’t agree with or simply cant implement due to the climate, region or country that we live in. However, without a broad knowledge of what other people are doing out there it is all too easy to become stuck in old ways or taken along with the ‘newest’ quick fix product. Old, tried and true ways handed down through the generations are often very important, especially in farming, but I think it is also important that we progress and work towards more efficient farming methods. This does not necessarily mean buying the latest machinery item or upgrading the dairy but rather thinking more about how and why we do things on the farm. 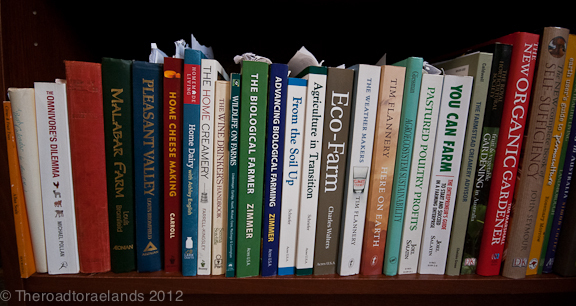 Either way, many of these books have motivated and inspired me to approach farming and Agriculture in positive ways rather than with pessimism. I think that modern day Agriculture is all too often pessimistic, which gives consumers a negative outlook on farming and sends the sons and daughters of farmers towards a life in the city. Lets start thinking positively and sensibly about how we can encourage young farmers and feed a growing world population. This entry was posted in Farming and tagged Agriculture, Books, Ecological Farming Books, Farming, Farming Books, Food Issues, Raelands farm, Sustainability, Sustainable Farming, Young Farmers. Thanks for the list of reading materials. 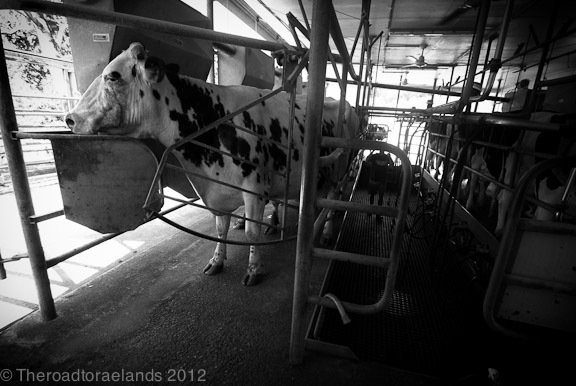 Love the blog & the black & white photos. Looking forward to coming back to read about your cheesemaking. I just checked out your blog, it looks like you guys have a really interesting farm business in Pennsylvania, although I don’t know how you deal with snow and frozen water troughs! I just made a farmhouse Cheddar yesterday so I will be sure to post about it soon.